Can I Play an HD-DVD on a Blu-ray player or Vice-Versa? Can I Play an HD-DVD on a Blu-ray Disc Player or Vice-Versa? HD-DVD (High Definition DVD or High Definition Versatile Disc) was once a competitor format to Blu-ray both of which were introduced to consumers in 2006. HD-DVD was primarily backed by Toshiba. However, the HD-DVD format was officially discontinued in 2008. However, there are HD-DVD players still in use and both players and movies are sold and traded on the secondary market. For those that own, or run across, HD-DVD players and/or discs, it is important to note that the Blu-ray Disc and HD-DVD formats are incompatible. You cannot play an HD-DVD in a Blu-ray Disc format player nor can you play a Blu-ray Disc on an HD-DVD format player. Although both formats do have a lot in common, such as the ability to provide up to 1080p video resolution output and are compatible with most Dolby and DTS surround sound formats, including Dolby TrueHD and DTS-HD Master Audio, as well as Uncompressed PCM, the reason you cannot play an HD-DVD in Blu-ray Disc player, or vice versa, is primarily due to differences in actual physical disc structure. Both disc formats utilize blue lasers that read the pits on a disc that contains the digitally stored video and audio information that conforms to Blu-ray or HD-DVD format specifications — and here is where the difference starts. The pits on an HD-DVD are different in size than on a Blu-ray Disc, which means that the disc must be read by a laser that outputs a specific light wavelength to read the designated pits. The actual discs used in both formats are the same physical size (CDs, DVDs, Blu-ray Discs, and HD-DVDs discs all have the same diameter), but an HD-DVD has a 15GB per layer storage capacity, while a Blu-ray Disc has a 25 GB per layer storage capacity. In addition, there are variations on how the audio and video information is placed and read within the physical characteristics of each disc format. Another difference between the two formats includes how the disc menus are constructed and navigated. Of course, another reason the two types of players were incompatible with each other's discs has to do with politics. For the most part, manufacturers at the time the two formats were made available, didn't want to have to play the necessary licensing fees required to use both formats and, of course, both the HD-DVD and Blu-ray Disc patent holders (mostly Toshiba vs Pioneer and Sony) put pressure on manufacturers to adopt their format, exclusive of the other. On the other hand, both LG and Samsung actually did come out with a limited number of players (3 in the U.S. market) that could play both HD-DVD and Blu-ray Discs. However, these players were withdrawn in 2008 after the discontinuation of the HD-DVD format. If you are one of the lucky few that actually own one of these specially designed Blu-ray Disc/HD-DVD combo players by LG (LG BH100/BH200) or Samsung (BD-UP5000), and have HD-DVD discs to play on them, you have something that is very rare in the history of consumer electronics. One thing that may confuse consumers with regards to playing HD-DVDs, is that some HD-DVD movie discs have an HD-DVD layer on one side and a standard DVD layer on the other. In this case, you can play the standard DVD layer in a Blu-ray disc player, but if you flip the disc over an insert the HD-DVD side of the disc into a Blu-ray Disc player, it will not play. Now, you are probably asking yourself why HD-DVD and Blu-ray Disc players are able to read DVDs and CDs which do not conform to either HD-DVD or Blu-ray Disc specifications. With reference to DVDs and CDs, manufacturers of both HD-DVD and Blu-ray Disc players made the decision early on to make their players more attractive to consumers by making them backward compatible with CDs and DVDs. This was accomplished by adding a focus-adjustable red laser assembly to their players in addition to the need blue-laser assemblies needed for HD-DVD or Blu-ray Disc. 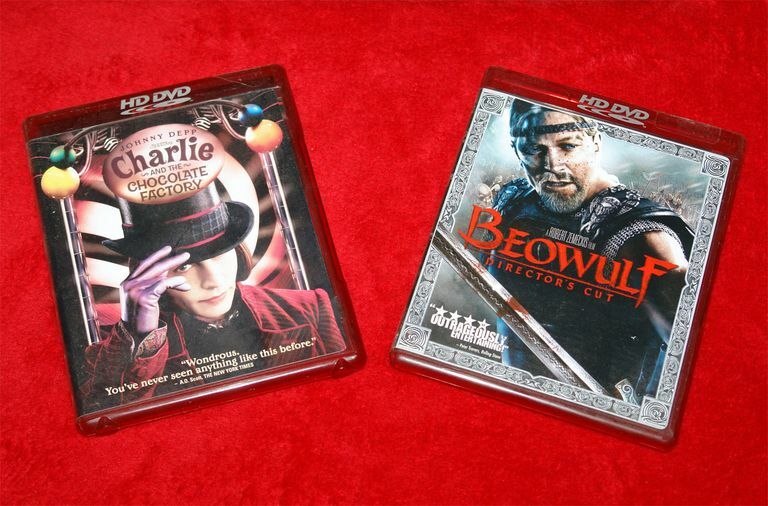 As a note of trivia, Warner Bros actually developed a disc that was Blu-ray on one side and HD-DVD on the other, with the idea of releasing movies in both formats on a single disc, but the effort was not adopted by either the Blu-ray or HD-DVD backers, so was never realized as a product. With all the disc formats that provide access video and music content, sometimes it can get confusing as to which disc will play what player. However, it is important to point out that HD-DVD movie discs cannot be played on a Blu-ray Disc player, and Blu-ray Discs cannot be played on an HD-DVD player, except for the few HD-DVD/Blu-ray Disc Combo players that were made in limited numbers discussed above. If you still have a question as to what types of discs can be played on your Blu-ray Disc or HD-DVD player, every user manual for those players should have a page that lists the discs that your specific player is compatible with. By the same token, it should also list the disc formats that are not compatible with your player. If you don't have access the user manual or need further clarification, you can also touch base with tech support for your brand/model player, if it is available. Are Blu-ray and HD-DVD Discs Region Coded?